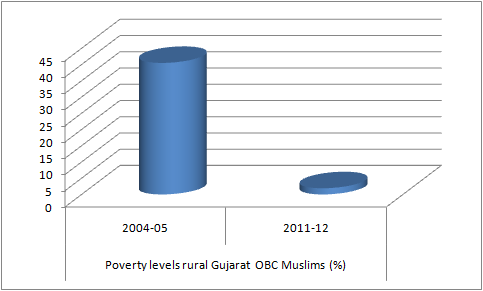 "Standard error" in Government of India report: OBC rural Gujarat Muslim poverty down from 40.5% to 1.9%! Facts have come to light suggesting that there is something extremely suspicious with the data in the new report prepared by the Government of India-appointed committee headed by Jawaharlal Nehru University’s (JNU’s) Prof Amitabh Kundu on the condition of Muslims in India. The report is a follow-up of the famous Sachar Committee report of 2006, which had pointed towards negligence of the minorities, especially Muslims, in different social sectors, particularly education and health, and seeks to suggest that poverty in rural and urban Gujarat went down drastically between 2004-05 and 2011-12. Quoting unreleased National Sample Survey (NSS) poverty data for socio-religious groups, the report seeks to suggest that in rural Gujarat, the number of Muslims below poverty line (BPL) fell from 31 per cent (about one-third of their population) in 2004-05 to a "measly" 7 per cent in 2011-12. Surprisingly, it does not find things as rosy in urban Gujarat. The report says that comparison of the same period reveals, those in the BPL population in urban areas declined from 42 per cent to 14.6 per cent. While a copy of the report, submitted to the Union ministry of minority affairs, could not be obtained, the data used in the report, in possession of Counterview, suggests something fishy. The data show, in rural Gujarat, other backward classes (OBC) poverty levels, which were 40.5 per cent in 2004-05, have gone down to just 1.9 per cent in 2011-12! As against to this, the Other Muslims’ poverty levels in rural Gujarat have gone down, during the same period, from 23.2 per cent in 2004-05 to 18.7 per cent. Based on these data, which admittedly are ridden with “standard error”, well-known pro-Narendra Modi economist Prof Arvind Panagariya, belonging to the no-liberal school and is with the Columbia University, has declared, “In rural areas, Gujarat leads with the lowest poverty ratio of 7.7 per cent for the Muslims.” The data that he has calculated (despite “standard error”) suggest that overall poverty in Gujarat (rural plus urban) is down from 36.5 per cent in 2004-05 to 11.4 per cent in 2011-12. He just accepts the unreleased NSS data he has obtained on face value, without bothering to question their validity.